Did you know that heavily discounted snacks at Walt Disney World is actually possible? It’s true! Let me explain. In case you didn’t know, a snack credit on the Disney Dining Plan is worth around $5. But one great thing about Disney World snacks is that they very greatly in prices. Some are cheaper. And some are more expensive. That’s why it’s really important to know when to use your DDP snack credits and when to use cash. So as a way to truly maximize your Disney Dining Plan snack credits, you should aim to find snacks that are over $5 that way you’re not leaving money on the table. But don’t worry, I’ll show you just how to do it in this comprehensive and super simple guide! When you get a Dole Whip, make sure to get a float. It’s a little more expensive plus you get fresh pineapple juice with it! You can get this from Aloha Isle at Magic Kingdom or the Pineapple Lanai at the Polynesian Resort. By far the best dessert at Kringla Bakeri in the Norway Pavilion at Epcot. And yes, it’s better than the schoolbread. One thing people tend to forget is that with a snack credit, you can get both a Mickey Pretzel and a cheese sauce. Most if not all Star Wars themed dessert options at the Backlot Express including themed cupcakes are well over $5. And they’re delicious! You can get these from Backlot Express in Hollywood Studios. You can actually get funnel cakes with sugar as a snack credit. Although the one I had (pictured above) includes ice cream, the one with just powder sugar is just as delicious! Get this from the Funnel Cake Cart at the America Pavilion in Epcot and Sleepy Hollow in Magic Kingdom. Minn and Bill’s Dockside Diner in Hollywood Studios by far has the best seasonal milkshakes. The all time favorite has to go the cinnamon churro milkshake of course. Just make sure that you get an ice cream cookie sandwich from Magic Kingdom and not Hollywood Scoops at Hollywood Studios because it’s actually more expensive at MK. You can get this from both Tamu Tamu Refreshments in Animal Kingdom and the Plaza Ice Cream Parlor in Magic Kingdom. Barq’s root beer and soft serve vanilla make this a great cold treat on a hot Orlando summer day. You can get this from Anandapur Ice Cream Truck at Animal Kingdom and Auntie Gravity’s Galactic Goodies in Magic Kingdom. Most if not all seasonal and special cupcakes are over $5. So really the hardest part is just choosing the best most delicious one out there. I like the cupcakes from both Starring Rolls Cafe and ABC Commissary in Hollywood Studios. 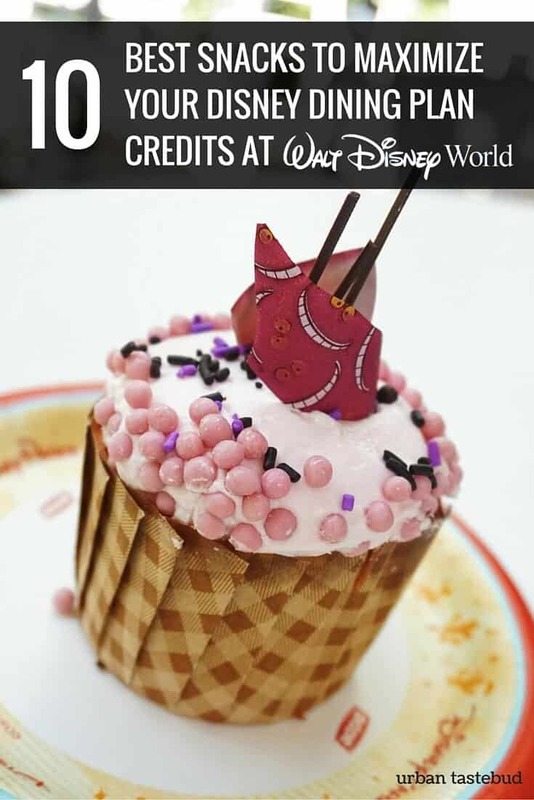 The one picture above is a Pink Lemonade Cheshire Cat Cupcake. Really good! Freshly made waffle bowls and scooped ice cream topped with whipped cream hot fudge (or warm peanut butter). Pure perfection. I dare you to walk past the Plaza Ice Cream Parlor in MK and not be temped to get one of these bad boys. Have any more Disney Dining Plan tips or delicious snack suggestions that are over $5? If so let us know in the comment section below. And of course, don’t forget to follow me on Instagram for Disney pics! Found your post via Pinterest. Good suggestions! I’ll be sure to try some of these next WDW trip. I’d also add the cinnamon bun at Gaston’s Tavern in MK and any of the delicious pastries from the France pavilion in EPCOT. I would like to take up a free Hubpages weblog around the WordPress blogs web-site (not really my own, personal domain) nonetheless don’capital t such as styles they supply. May i work with a saved topic on the? I know of some Hubpages published blogs and forums with some other themes, in order that it seems as if it’vertisements feasible..
Sea–I think Kevin is saying I should read the Bible with the discernment to determine which parts are true and which are just literature. It seems like discernment might also be reading it with the possibility all of it is just literature–maybe nothing in it really happened. With the exception of the pretzel, these were all desserts. I was looking for more savory snacks. I don’t know if it’s a deal or not, but the snacks we are looking forward to next time we go in December ’17 are the kung pao egg roll and peach oolong boba tea at Joy of Tea in China Pavillion in Epcot. Would be nice to see some more savory options. One can easily overload on sweets in WDW. the fried rice next to Yak & Yeti in Animal Kingdom is a really good one! Eight Spoons Cafe in Animal Kingdom serves baked macaroni and cheese as a snack credit. The baked mac and cheese with pulled pork is about $6.30 and the mac and cheese with shrimp and sweet chili sauce is about $6.50. This was our favorite find last trip and we can’t wait to go back this year. All four parks have a Starbucks in them now. You can get a venti coffee with up to 2 extra shots of espresso for one snack credit. I can’t understand why the snacks all seems to be junk food. Not looking forward to using my snack credits that way.